Gordon Tartan Ribbon is available to buy in 10mm (3/8"), 16mm (5/8"), 25mm (1") and 38mm (1½") widths on 25 metre (approx 27½ yard) reels. The Gordon Tartan Ribbon sold by tartan-ribbon.com is top quality, authentic Scottish tartan ribbon as certified by the Scottish Tartans Authority. 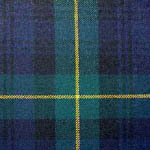 The dark green and blue undercheck is the Government Tartan (Black Watch) with a single gold overcheck. Most military tartans are based on the Government tartan with different coloured overchecks to denote various regiments e.g. a white overcheck for the the Douglas tartan of the Cameronians (Scottish Rifles). A word of warning... never refer to the Gordon tartan as having a "yellow" check... any old Gordon highlanders within earshot may be less than chuffed as yellow suggests a lack of courage ("there's nae yellow in the Gordon!"). The overcheck is always referred to as gold! 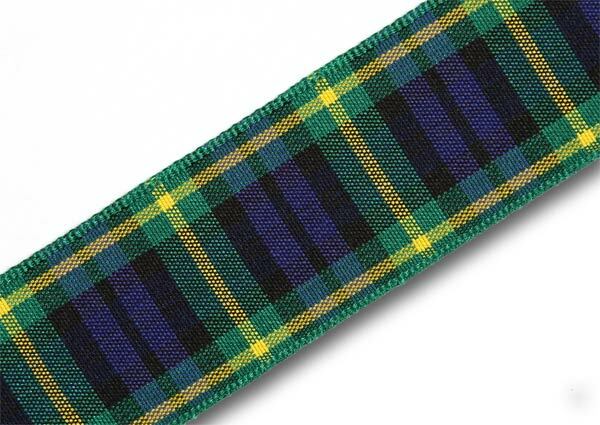 The Gordon Tartan Ribbon is as worn by the Gordon Highlanders, the distinguished highland regiment raised in 1881. The regiment was amalgamated with the Queen's Own Highlanders (Seaforths and Camerons) in 1994 to form the British army's only highland regiment: The Highlanders.